Creative art consultants for residential and corporate clients. This winter we signed up for an unforgettable art trip to Uruguay organized by our friend Caroline Wallace. Ten of us arrived at the elegant Estancia Vik in the midst of a driving rainstorm at midnight – with only glimpses of the surrounding country side lit up by bolts of lightning. This southern tip of Uruguay is wide-open South American cowboy/polo country with untouched beaches and breathtaking sunsets. The changing landscape is a source of inspiration for the artists and the art we were to discover. Upon arrival, we were whisked to our own master suites in the open air hallways of the “ranch”. Each suite is designed by one of Uruguay’s leading artists – mine was a mini retrospective of Lacy Duarte’s art complete with a head board with carved dolls and gorgeous works on paper on the walls. I woke up each morning to horses grazing outside my two walls of floor to ceiling windows and a view of the signature winding lagoon to the ocean. We painted this view several times during our stay with the help of the resident artists. 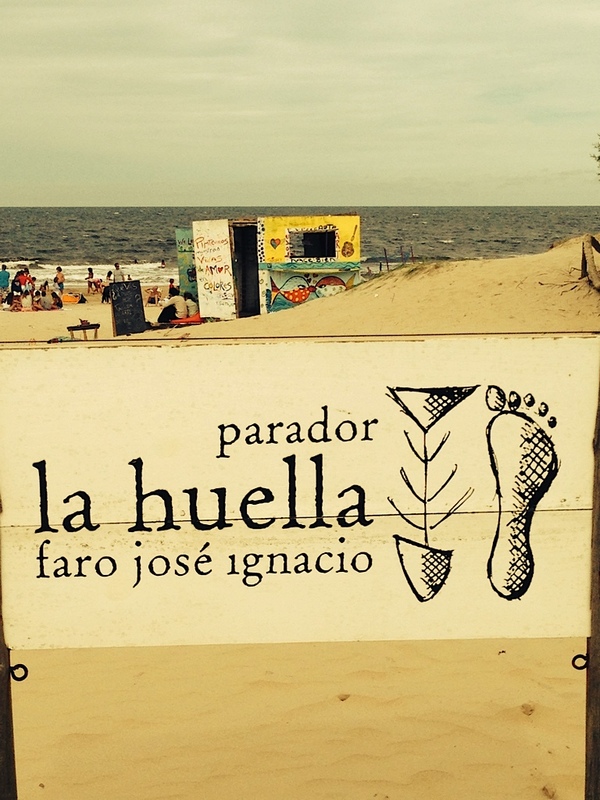 The laid-back-chic town of Jose Ignacio is just a few miles away and an easy bike ride. Lisa and I biked in one day to check out the shops which ranged from a little shack on the beach for geodes and other organic souvenirs to bohemian high end fashion sprinkled along the dirt roads of town. This little town has been discovered by the international foodies. La Huella is a feet-in the-sand gem of a restaurant, lit by tiny white lights, and offering fish just plucked from the sea and salads grown in the nearby fields. The bar and restaurant attract glamorous international adventurers and nearby wealthy Argentinians. One day we headed to the beach to paint and enjoy a cooking class at La Susanna where we learned how to make the local caprihosas and a salmon ceviche while standing in the sand. We had cocktails with the Vik artists at La Susanna and had a chance to see their recent work. Lisa and I were so taken with them and the art that we were inspired to bring a few things home for ourselves and friends… Actually we were so excited about their work that we arranged to meet them in their studios in Montevideo. What a treat to be chatting with artists surrounded by their work. Yes, we had to select a few more paintings! Artful Living was born out of the trip because we wanted to share these beautiful works of art from Uruguay. We hope to sell the pieces we still have (one 4 x 8 foot painting was recently shipped to a beach house in Naples). Already planning other trips this year, we plan to continue to offer new pieces to friends…if we can part with them ourselves!